Recently Android Users are getting Error 936 on their smartphones whenever they try to Download or Update any app from Google Play store. To be very precise, The error message Reads *App Name* could not be downloaded due to an error (963). Earlier we discussed how to Fix Error 492 in Google Play store. This time, we will be discussing another google play store error but with a different solution. HTC M8/M9 users are more found complaining about this error all over the web. If you are one of them, then let me tell you that your search for the solution ends here on this page because we at Fixerrs.com Provide solution that actually works. 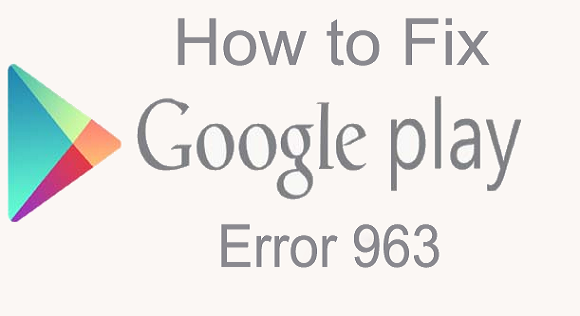 Today we are Sharing not 1 but 3 Methods that can help you to get rid of this Play store error 963 easily. The Solution to this Error is not Rocket Science but you still need to Perform some steps that are explained in details below. Before we see how to fix this error, It is the best idea to Understand the error and know what are the reasons for getting this error on your phone. Once you know the reasons, It becomes easier to Fix it. App Cache: Play Store app cache may be the Culprit. SD Card: If the app is downloaded to SD Card you may see Play store error 963 on your phone. Play Store Version: Updated Play Store version can also give you this error. Select the app that was showing the error and Clear cache and data. That is it, Now try and download the app again and see if the error Persists. If the Caches were the problem, your issue must be solved. If not, Keep reading. Unmounting SD Card on your Phone might just help you to get rid of Play store error 963, What we are going to Do is, Unmount SD Card, then Try to Update/Download the app and lastly Remount SD Card. Simply go to Settings > Storage > Unmount SD Card. Now try and download or update the app which was causing problems for you. Once you successfully Download the app without any error, Now its time to Remount SD Card by Navigating to Settings > Storage > Re-mount SD Card. If the app which is giving you error is in SD Card, then you should first try to move it to Internal storage. To do so, Go to Settings > Apps > All > Select the App > Move to Internal Storage. There are chances that the Recent Google play Store update is causing this Error, There are every chance that the Updated Version of Google play store may have Compatibility Issues. So in this case, you will need to Uninstall the updates of play store. Go to Settings > Apps > Uninstall Play Store Updates, Now Try and Download/update the app which was showing the error. This Method should most probably Solve the issue for many. Just in rare case if none of the above works for you, and if you still get the error on your phone you can try Uninstall the App Completely or Even Uninstall Play Store and then Install it again by downloading from Trusted Sources. You can even try and remove the email id attached to your Play Store account, Reboot your phone and again add the same Id and see if this fixes the issue. But do this only if the Principal Methods mentioned above fails to work for you. Let us know which Method Worked for you to Get rid of Google Play store error 963 on your android phone. If at all this page helped you, then take some time and Comment below which one worked for you. This will also help other readers having the same problem and will save lot of time. "Unmount sd card' worked for me. Thanks! Yes! Thanks a lot! Method no.2 worked for me. I had error 963 on a Asus ZenPad 8.0 with Lollipop 5.0.2. I had tried clearing out the Play Store Cache for this error, that didn't seem to work. What did work was to just stop the "auto moving to SD" function that Asus offers in the Settings. I didn't have to unmount the card, or mess with the launcher. Tho' those are good things to know if I need to try them in the Future. I also had an Error 506, that with all of the things that I did, I'm not sure what fixed it. Turning off the Auto Scanning utility, the AutoStart util, or clearing out the Play Store Cache, and rolling it back to factory version. But that APP (Kindle) did install. With all of the Junk that Asus installed and I've disabled, I'm giving serious thought to ROOTing it to clear out their crapola. I am using asus zenfone selfie. And i must change the sd card. Thx for the information. Thanks for this article.. Method 2 (Unmounting SD card) worked for me.. Downgrade play store verison worked for me. Thanks! I'm using Lenovo A1000 and unmounting the SDCard worked for me! Downgrade Play Store! Thank you!!! Unmounting the SD Card on my Samsung Galaxy J2 worked. Never had a problem with this error and having to go through this process before. I hope its not a regular thing. Lucky i kept my reciept for my phone. Downgrade Play Store for me thanks! Thanx method 2, worked for me. My mobile coolpad note 3. Tank you Dismounting the SD Card worked. Much appreciated. Thank you so much putting Google play back to factory settings worked for my hudl 2. YAY!!! Unmounting the SD card and/or uninstalling Google Play update worked. Have Samsung using android 5.1.1. Downgraded Play Store and that solved the problem. Thanks. Unmounting my SD card worked. Thanks! downgrading playstore.. worked for me. The apps that were causing the issue were on my SD card, so I had to move them to the device storage, and then update. Very annoying, and I've never run into this issue until now on my Samsung Galaxy S5. #2 worked for me -- thanks so much!!! Same for me - can update if 1) downgrade PlayStore (but it gets updated again within minutes), or 2) app is moved back to Device Storage. Number 1 didn't work. I had to unmount the SD card. Method no. 2 (unmounting SD card) worked for me, thanks so much!!! This had been driving me crazy for quite some time! For me as well - good info! I never load apps to my SD card. Nevertheless, unmounting the SD card was not enough. I had to physically remove the SD card, then the install worked. Uninstall Play Store Updates! Thanks!!!!!!!!!!!!! Unmounted SD card work. Thanks. Thank you. Finally answers that fixed the problem. Downgrading play store solved everything. I'd had this error on every app I tried to install before this solution. Unmount SD Card works for me, thanks a lot guys! Uninstalling play store updates worked for me on a Samsung Galaxy core. The app I had trouble installing was AutoZone. I tyred all of this but I got "-505" error code. Unmounting the SD card worked. Thanks so much. I just wish I could restore my progress. Unmounting the SD card worked for me! Thank you! Unmount SD card worked for me too. HTC One M8. Tried option one no joy,move app(Quickpic) unmount SD,update app Bingo!! and thanks people.Phone model is Moto G 2nd Gen LTE 2015. #3 downgrading Playstore (uninstalled updates) worked for me. Thank you. Step 2 worked for me. Tried all methods on galaxy tab2. just unmounting (not physically) sd card worked ! App cache didn't work. Moving the apps that wouldn't update back to device storage from the SD card did work. Option 2 worked on our Samsung galaxy tab a. Thank you! Method 3 worked for me. How sad that the updated version is Fubar on a Note 4. Ditto. I tried app and cache data by themselves. No luck. Then I repeated that and unmounted SD. Install successful. Unmounting sd card worked . Thanks for fixing an annoying thing. Unmount SD card, thank you very much. Working off a note 4 and the playstore was the culprit. Unmounting external SD card worked, thanks! Unmounted the SD card and it worked like magic. Never would have thought of that on my own. Thank you! Downgrading Google Play Store on my LG V700 tablet worked. Thanks. Clearing cache did not worked. Unmount SD card is inactive. What to do?? Unmounting SD Card did the trick. Option 2 helped. But transferring all the apps back to the device is not only tedious but also slows down the device. Hope it's a temp issue with Google and we can transfer all apps back to sd card. Thanks. I use Pure shot+ (Hisense) and I uninstall the play store update. the version is 5.5.12. It works well. It updates automatically, however keep uninstalling Google play update and return to original version as since the new update will keep having error messages when updating some apps, even though Google are saying it is not the update they will not look into it!! i unmount the sd card and then it works, it late but works, thanks buddy! No2 worked for me also. Thanks! I got a warning saying it would permanently delete a bunch of stuff if I deleted the data, and I'd already done step two, so I went to step three and used a downgraded version of the playstore, and sure enough this worked. Thank you so much. unMount SD card worked for me. thanks for the update. Thanks! Option 2 worked well for me. Unmounting the SD card worked for me as well . Owner of a Samsung Galaxy S4. Thanks a lot !!! Unmounting SD card did it for me. Thumbs up. Yes! Thanks a lot! Method no.3 worked for me. On Samsung Grand Prime downgrading playstore worked! same problem with lenovo k3 note, solved with Google play downgrade! Downgrading worked well on my Acer Liquid Z220. Unmount worked after fighting this for the last four hours! You guys rock! Samsung Galaxy S5 downloading the Dominations 3.7 update. I uninstalled the Google play store updates, cleared the play store cache, moved dominations to internal memory, and unmounted my SD card. You should be able to update dominations. Not working for me on lenovo k3 note....actually thss problem only occurs with some apps like swing, stack both are from ketchapp. I had to do a restart, THEN unmount my SD card and that worked. Thanks. Unmounting SD card solved the problem. Galaxy S4 LTE. Unmount the sd card for me also. But now what? Do I have to do it every time? I had to uninstall Google Play updates, everything else didnt work. I hope they fix this soon. Whats weird is some people arent having this problem. My wife has the exact same phone & hers is fine. I uninstalled the updates as suggested and it worked, Motorola Droid Turbo. Moved to storage mobile from SD. Moving the app from the external SD CARD solved the update problem. This must be a new bug. I didn't have to do this before and updates still worked, though the updated app would have been moved by Playstore to internal storage automatically. Downgrading Google play worked for me. Guys, this is obviously a Google problem. Not us. This is absolute rubbish. Their play store people messed up. Our phones are ok. Having to unmount is such a hassle. Option 3 worked for my s5 thank you so much! Sd card unmount on galaxy s5. Unmount SD card worked for me THANK YOU! After contacting Google support who couldn't figure it out (Really?) then being transferred to another support team who woul "kindly" offer me a monthly or yearly charge for their "expertise" to fix my sons tablet beyond unfair and frustrating thank you again hallelujah. I moved the apps I was trying to update to my device's storage from the SD card. This worked like a charm. I didn't have to unmount or anything. Tried the cache and app data removal first with no help. The I unmounted SD card with no help. Then I removed the card and restarted the phone and it worked. Had to Uninstall the updates in order for me to finally update my apps. Uninstalling the updates for the play store worked for me. Thanks! Number 3 worked for me. Lenovo A5000. Thank you very much! Clearing App Data solved it for me. Clearing Cache, force stopping, and unmounting SD card did nothing. uninstalling Google Play updates worked for me. Thanks! Unmount SD card worked for me. Thank you very much. #3 Downgrade Google play store worked for me. Thank You!!! It was the SD card for me! Thanks my good friend! Uninstalling Google store updates and replacing it with the factory version worked for me. Samsung Galaxy Prime. Thanks guys! Okay so i've resorted to the last option which is the downgrading the Google play store. and re-install updates. yes. this time it works. Hopefully it stays that way. Thanks for the tips. I tried all three methods and was still getting error code at install time. I read on another site to clear the cache on Google play services framework. As soon as I did this the app in question loaded and installed just fine. This was on a Galaxy Tab A.
Unmounting sd card worked on samsung galaxy tab a.
Unmounted SD Card worked thanks alot!! Unmount SD card. That worked. Thanks! Had to move the application to the device storage. Thank you for the fix.